General Motors recently introduced a new compact SUV for 2013, the Chevrolet Trax. The only problem for U.S. is that it is not being sold in America. The compact Chevy will go on sale in Mexico and Canada during Fall 2012, offering buyers an affordable, fuel-efficient alternative to the larger Chevy Equinox. The Chevrolet Trax will be officially unveiled at the Paris Auto Show in September 2012 . General Motors has already allowed the curious to get more than just a peek at the exterior design of the vehicle, with photos of the model readily available online. 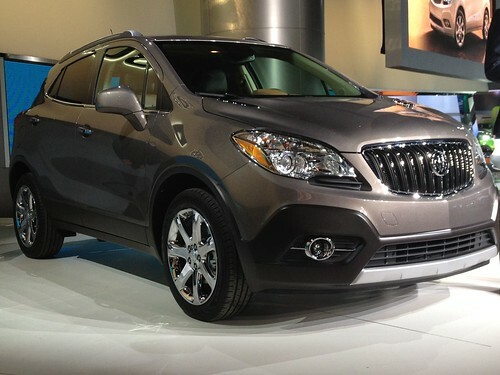 It is modeled on the Gamma II platform and resembles a smaller version of the Buick Encore. This crossover design is certainly one that focuses on compactness while at the same time offering plenty of interior cabin space. The front grille is tall and gives the vehicle a stubby, yet stylish appearance. Chevrolet is betting on the public’s desire for a fuel-efficient crossover that handles well in urban traffic. General Motors says it has no plans to offer the 2013 Chevrolet Trax in the United States. The popularity of the Equinox model is the most likely reason. The Equinox is considered a mid-size yet compact SUV, and this model has sold very well since its inception. Chevrolet obviously does not want to create a direct competitor for its own models. This decision may change for a future model year as buyers seek more fuel efficient, smaller models. General Motors has announced sales of the 2013 Chevrolet Trax in a total of 140 countries, with the model being marketed under the Holden marquee in Pacific Oceania region. Lengthy research has resulted in conclusions that the vehicle will be quite popular with both singles and families, used mostly as an urban and suburban means of transport. Although the exterior design of the 2013 Chevrolet Trax is now available, the question of powertrains remains unanswered. Many have speculated that the vehicle will be powered by the 2.4L 4-cylinder engine found on the Equinox model. Others believe that this small SUV will contain a much more economical – albeit less powerful – 1.6L in-line engine. It is quite possible that European markets will be able to obtain the vehicle with a 1.7L diesel engine and perhaps even a 1.4L turbo. The number of trim options has not been announced, nor has information about manual versus automatic transmission been released. If the car was for sale in the United States, the transmission would almost certainly be automatic, but the European market may want to have a choice. Front-engine, front-wheel drive will be standard on this newest entry into the compact SUV segment. It has not yet been announced if the base trim will be available as an AWD model. Photos released by General Motors indicate that at least one of the trims offered will have such standard features as roof rails, halogen headlamps, alloy wheels and a choice of metallic paint finishes. Because of its intended use as a smaller commuter vehicle, the 2013 Chevrolet Trax may not have an available sports package that would include performance tires and a tow hitch. midsize SUV segment in terms of annual purchases. The public is demanding that a compact SUV with seating for five be comparable to compact sedans in terms of fuel efficiency. It will be interesting when to see when Chevy brings a true compact SUV back to the U.S. market. John Reynolds authored this post on behalf of Kanetix.ca where you can find insurance from Ajax and other leading Canadian carriers. Click here for free quotes.